Soft water greatly reduces the scaling of pipes, water heaters, faucets, and bath fixtures, and reduces spotting of glasses, dishes and flatware. Soft water also helps detergent clean your clothes better, while making your clothes last longer too! You can reduce your laundry detergent, dishwashing soap, hand soap ad shampoo to half what you would normally use, not to mention soft water is much more pleasant to wash with, leaving less soap scum on you, and your tub/shower. The performance of a water softener is dependent on two key components; a resin bed that cleans the water and precision equipment that cleans the resin. The two most significant elements that differentiate one softener from another is the volume of resin and the type of control valve. At CBS Systems, we value the efficiency of the Vortech designed tank. The control valve: routes the water flow through the system and controls the operating cycle. Hard water passes through the resin bed to become soft. During regeneration, water flow is reversed to clean the resin bed. Brine is pulled in and then rinsed out to regenerate the resin, preparing it to soften more water. The brine tank is then refilled with fresh water for future cycles. 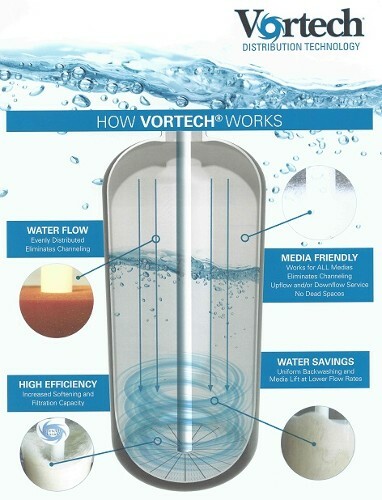 The Vortech design: improves water flow through even distribution and eliminates channeling. Works for all medias and creates no dead space by creating upflow AND downflow. Higher efficiency that increases softening and filtration capacity while saving water with a more uniform backwash. The resin tank: contains media called resin. The resin attracts and collects minerals from hard water. Once the resin is saturated with hardness minerals it must be cleaned and regenerated. Once regenerated, the resin is ready to remove more minerals from the water. The brine tank: stores salt and water to make brine which is used for regenerating the resin. Resin can be regenerated with sodium from salt or potassium chloride. While water is in the ground, it picks up soluble bits of whatever it passes through. While this can mean contamination that makes the water unfit to drink, in many cases it simply means that the water contains minerals found in the earth. Of these, calcium and magnesium are of particular importance because they affect the water's ability to function in our homes. These minerals make our water hard. One effect of hard water is that soaps and detergents lose some effectiveness. Instead of dissolving completely, soap combines with the minerals to form a coagulated soap curd. Because less soap is dissolved, more is required. And the sticky insoluble curd hangs around--it clings to the skin and may actually inhibit cleansing. Washed hair seems dull and lifeless. In the laundry, things aren't much better. The soap curd can work its way into your clothes as they're being washed in your automatic washing machine. This can keep dirt trapped in the fibers, and it can stiffen and roughen the fabric. In addition to affecting the actual washing process, insoluble soap deposits leave spots on everything you wash—from your dishes to the family car—and a soap film will build up in your bath and shower. Another reason to be concerned about hard water is its effect on your plumbing system. Calcium and magnesium deposits can build up in pipes, reducing flow to taps and appliances. In water heaters, these minerals generate a scale buildup that reduces the efficiency and life of the heater.